We can always use a moist, delicious, and oooohhhh so easy banana bread recipe, and here it is! If you don’t have the blueberries you could easily substitute blackberries, raspberries, or just skip the berries altogether. This would make an especially lovely French toast too. Just sayin’. These are Kyle’s final days before Ironman Louisville next weekend and I’m happy to make some treats to keep him going. Good luck #540 we’ll be cheering you on!! This recipe is an adaptation of my friend (and fellow TriWidow) Jorien’s post from triwidows.com. Her recipe certainly didn’t need any messing with, but I couldn’t resist the urge to throw in some blueberries. It turned out beautifully thanks to Jorien who originally used dates and walnuts which sounds fantastic, but alas I had neither of those items on hand. Perhaps she’s a future food blogger in the making? Triwidows.com is a social networking site for triathlete supporters that I started recently. I’d love if you stopped by to check it out! 1/3 cup honey - go local keep the bee population employed! Preheat oven to 325°. Mash the bananas and mix them with the beaten eggs. 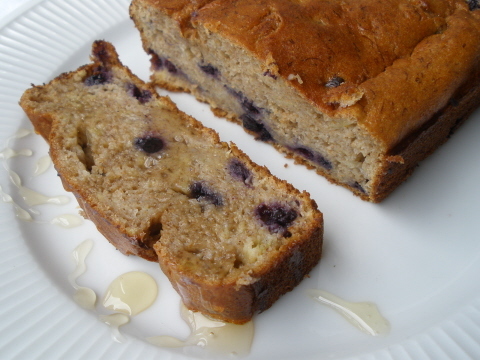 Stir in the honey, flour, baking powder, salt, cinnamon, then delicately fold in the blueberries. Put the mixture in a buttered baking tin (ideally a glass one). Put the baking tin in the oven for about 35 minutes in a 325° preheated oven, or until toothpick inserted in the center comes out clean. Let the bread rest for 5 minutes before removing it to cool further. Enjoy with copious amounts of local honey (to ward off allergies of course).